The 12-month forecast (above) indicates exceptional deficits in South Australia from the Eyre Peninsula to the eastern border with Victoria, in much of Tasmania, and the southwest tip of Western Australia. Deficits of varying severity, including pockets of exceptional deficits, are forecast for coastal and central Victoria. 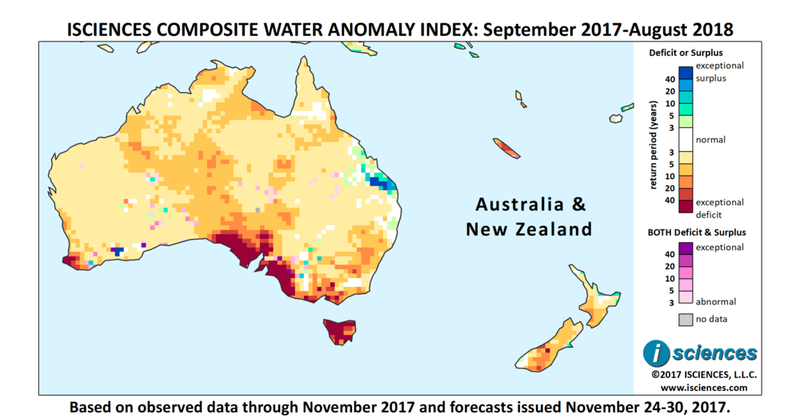 Moderate to severe deficits are forecast for the eastern Murray-Darling Basin in New South Wales, and in New Zealand. Deficits reaching extreme intensity are forecast for New Caledonia. Primarily moderate deficits are forecast for the center of the country reaching through South Australia. Moderate to exceptional surpluses are forecast near Bundaberg, Queensland. Australian wheat exports were cut this month and expectations for coarse grain and canola shipments were downgraded to seven-year-lows, all due largely to drought conditions suffered this year. Sorghum benefited, however, from the same rains which disrupted wheat harvesting in eastern regions. Barley production dropped, causing Australia to lose lucrative exports to the Chinese beer industry. Parts of New Zealand are experiencing drought conditions, with water restrictions in Wellington and Napier on North Island, in Southland on South Island, and rationing in Waimea Plains, South Island. A 200-hectare (500-acre) scrub fire blazed in Otago mid-December, prompting fire officials to require permits for open air fires. A record dry November preceded by two consecutive years of abnormally wet spring weather that hampered grass growth has New Zealand dairy farmers struggling. Frontera Cooperative Group has cut milk forecasts this month to reflect virtually no growth over last year. Along with drought, increased regulations and changing dairy markets have contributed to a drop in the net confidence of dairy farmers from 50 percent to 18 percent in the last quarter. One rural economist predicts a rise in the number of dairy farms on the market as farmers' stress levels increase. Exceptional deficits observed in recent months in Australia are forecast to nearly disappear. However, severe to exceptional deficits are expected to persist in much of Tasmania through February 2018, receding somewhat thereafter, and in the far southwestern tip of Western Australia near Busselton through May. The near-term forecast (through February 2018) includes moderate to occasionally extreme deficits along Australia’s southeastern coast from Adelaide through Victoria and moderate deficits for eastern New South Wales. Exceptional surpluses are forecast near Bundaberg, Queensland. In New Zealand, deficits are expected to moderate but persist. From March through May some moderate to severe deficits will continue to emerge in the southwestern tip of Western Australia, from the Fleurieu Peninsula in South Australia through Victoria, in Tasmania, and in New Zealand. Surpluses near Bundaberg are expected to become mild. The forecast for the final months, June through August, indicates moderate deficits across northern Australia and the southwestern tip, and the emergence of extreme deficits in central Tasmania.